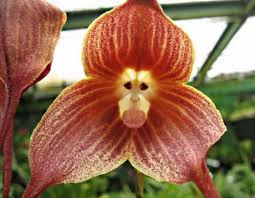 The first time you come across a picture of a monkey face orchid, you can be forgiven for thinking that you are looking at an image that has been subjected to photo editing. 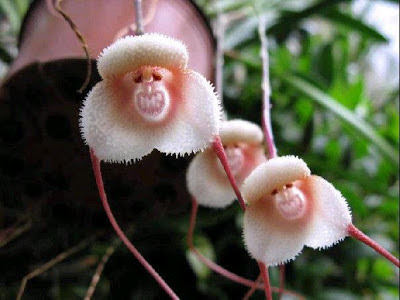 But I kid you not, Monkey face orchids are not only real, there are number of species - each with a different face! Dracula simia, called also "Monkey Orchid" or "The Monkey-Like Dracula," is an epiphytic orchid in the genus Dracula. As you can clearly see from the images within this post, the arrangement of column, petals and lip strongly resembles a monkey's face. Incidentally, the genus name 'Dracula' refers to the strange characteristic of the two long spurs of the sepals, reminiscent of vampire fangs! The orchid is in fact a recent discovery and was only named in 1978 by the botanist Luer. Research has discovered that the monkey orchid is part of a family containing over 120 species, mostly found in Ecuador. The monkey orchid is extremely rare, and only a few lucky collectors have been able to habitat. They are found only on the mountains of Ecuador and Peru at elevations of 1000 to 2000 meters above sea level. Up in the cloud mountains the monkey orchid can flower at any time – it is not season specific. The plant blooms at any season with a single 5 cm successive flower. These fascinating flowers are also endowed with an unusual fragrance, the scent of a ripe orange. I bought mine on eBay also. Looking for something different and these popped up. I am going to plant them in an indoor pot and cross my fingers. Not expecting much, but maybe I’ll get lucky.